In all the flurry after the POM Wonderful Party, and trying to come up with my Iron Foodie entry, I totally left out the dish that was the centerpiece of my dinner: The lamb shanks. 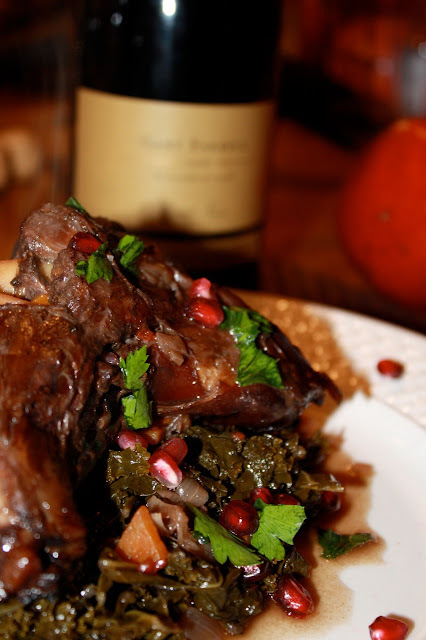 In fact the entire menu was built upon my desire to cook these shanks with their lovely pomegranate marinade. Some people dream of counting sheep. I was recovering from my dental surgery, watching lamb shanks go over the fence 4 x 4 . The reason I love this dish is that it's pan roasted slowly in the oven so one can take care of other things (dessert, mani-pedis, anything Brazilian etc.) while it cooks away. Also there's nothing better than the deep, rich flavor of slow-cooked lamb infused with pomegranate juice. The juice acts as a tenderizer as the meat marinates overnight, making it melt-in-the-mouth tender for those of us who've had recent dental encounters... just sayin'. So here's how I made this two part recipe and glided smoothly into dinner. Heat 1 quart of pomegranate juice in a large saucepan. Boil it until it's reduced by 1/2. This should take about 15 minutes or so. Cool the juice. Put 6 lamb shanks into a large glass dish, pour the marinade over the shanks and tuck the whole thing into the fridge overnight. Heat 2 Tbs of oil in a heavy skillet. When the oil is hot, add in the salt and peppered shanks, a few at a time. Give them a nice browning. When they're done, put them into a roasting pan and hold onto them for a bit. Cook down until the onions start to get soft. This should take just a few minutes. 3 cups of a dry red wine. I used some Cab. Turn the heat up fairly high and scrape up whatever bits might be stuck to the bottom of the pan. Boil everything until the wine is boiled down to about 1 cups worth. Give it a good stir then pour the whole thing over the lamb shanks that are resting in the roasting pan. 2 cups of chicken broth. Make sure the shanks are about 3/4 covered. Cover the pan tightly with foil and stick it in the oven until the meat is nice and tender and falling off the bone. About 2 hours or so. When the lamb shanks are done, transfer them to a platter, cover them with foil and keep them warm. Stir 1 lb of chopped stemmed kale into the sauce in the braising pan. Keep stirring until it's wilted. When the kale has wilted, pour all of the vegetables into a strainer. Set them aside and keep them warm. Pour the sauce into a pan and boil it down until its reduced to about 4 cups or so. Place a portion of kale on each plate and top each serving of kale with a shank. Pour some of the sauce over the shank, sprinkle a few pomegranate arils over everything. I served this dish with Basmati rice with spices and pomegranate at the side. So there's the centerpiece of my POM Wonderful dinner. A great warming and great prepare-ahead company dinner, perfect for this time of year. UPDATE: Exclusive footage of Patsy the Wonder Huskys' Birthday Party. Patsys' birthday was December 2nd of course we had to celebrate. In the background is her baby picture. We didn't have much time to sing "Happy Birthday"
She wanted to be alone with her treat. Don't we all? Oh how I love lamb shanks! These look wonderful. Happy Birthday to Patsy!!!!! My...those look good. Could I sub in bone-in beef short ribs, do you think? Hub won't eat lamb...but he does love beef. Wow I just made lamb shank and have a whole case of pom would have never thought of this at all, looks marvelous! nice job Kathy! Wish I saw this one sooner! Not sure my comment went through so this may be a duplicate and you can delete it. I just made lamb shanks and this looks marvelous, would have never thought about using the pom! I have a whole case of this too. Amazing looking dish lovely presentation! absolutely! It sounds great. Beef and Pomegranate are naturals together. I mentioned this to my husband and now he wants it too!Let me know if you make it and how it turns out. thanks so much. It's one of my favorite recipes. Nom nom nom...how good these look! Well done Kathy, I love the POM reduction.